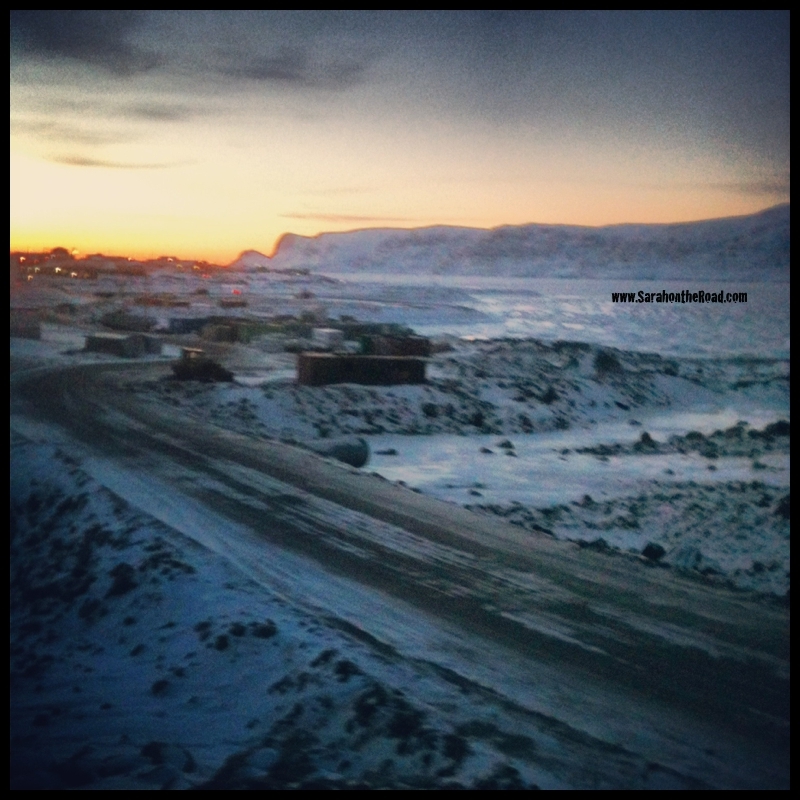 This past year I’ve been participating in the FMS Photo-a-Day monthly challenges. 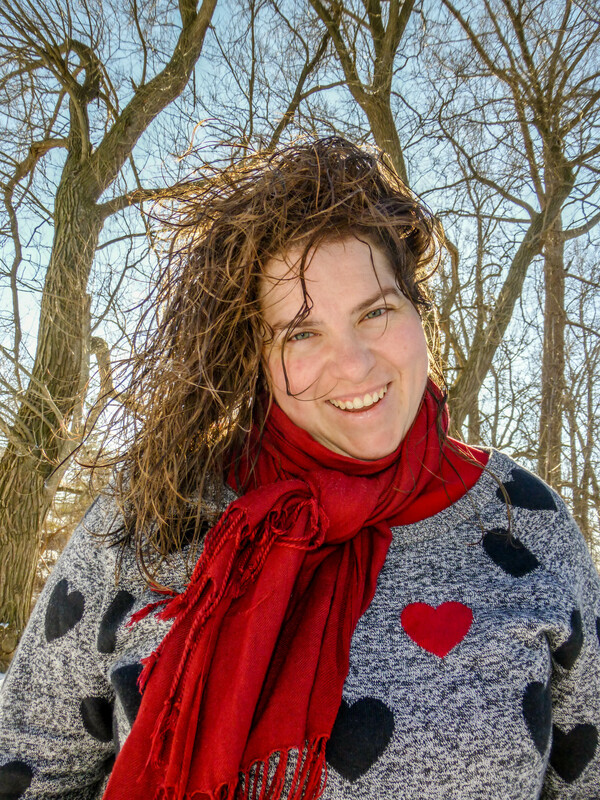 The organizer, Chantelle, of these monthly prompts also has a great blog! This is something I follow as well… so when I saw in October she was arranging an International Secret Santa gift exchange I decided to sign up! Participating in this has been heaps of fun. It was pretty easy…you had to respond to the emails and get an “Elfster” Account. I didn’t even know this kind of website existed…it’s perfect for setting up a gift exchange…it is able to ‘randomly’ set up partners and then you can ask anonymous questions of the person you are buying for to get to know them a bit more. It has other features like creating wish lists and stuff, but I didn’t use them. Then you had the fun of going shopping and spending about $30 on your gift for your partner. The main way to get to know your partner was done via Facebook. There was a “private” group set up…where we all spent time asking and answering questions. To participate you had to have an instagram account and/or a blog! This allowed for your Secret Elf to do some festive stalking to get to know you to buy you a gift! There are just over 300 people participating in this exchange. I did my shopping and sent off my gift before I came back north to Pang. It was just easier to do it and send it rather than try to fit my purchases into my already over-packed suitcases! 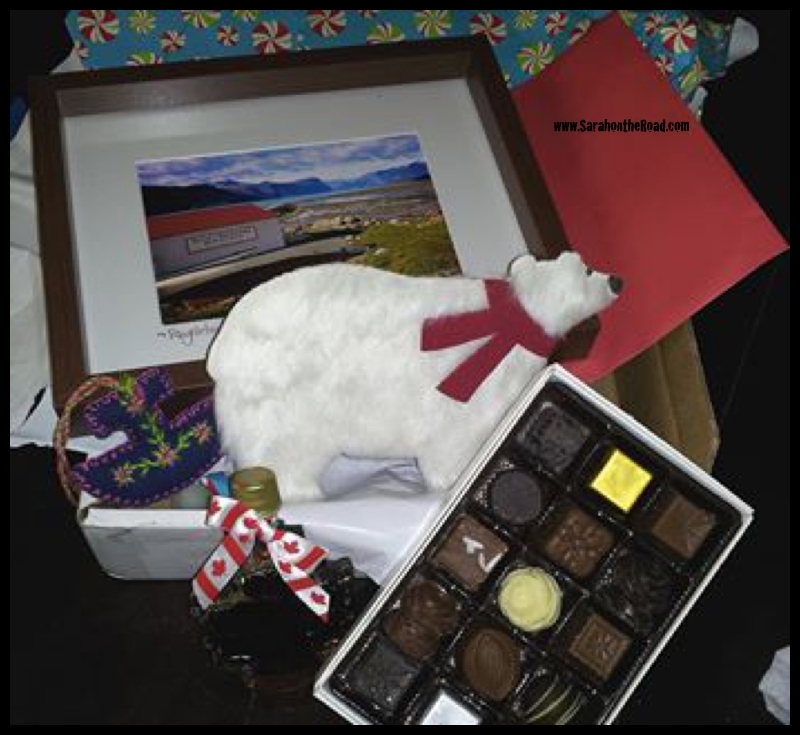 My gift went to Australia on the Sunshine Coast…pretty close to where I lived 10 years ago when I was in Australia. 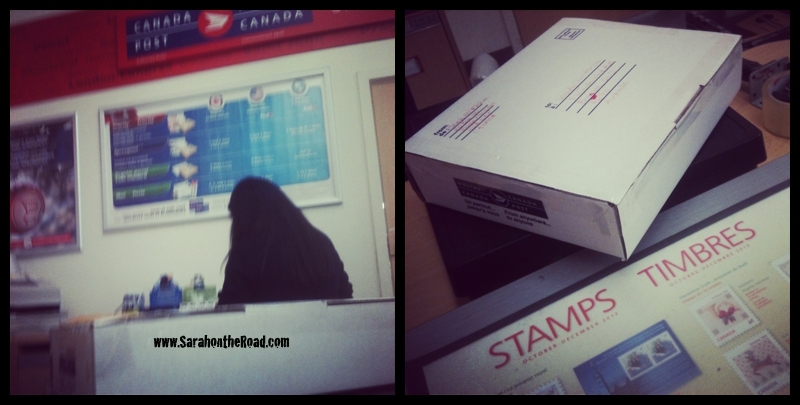 I knew doing this exchange it would probably be uber expensive for postage… and I was right. It cost me around $70 to mail this box off to Australia with a tracking #! To me this was just part of the gift, and that’s ok… but seriously…postage has gotten so expensive! So that solved the mystery of the gift I sent…. but I also received a gift from a Secret Elf that lives in Ireland! One of my first posts in the FB page was to talk about how I was concerned about the December 10th cut off date for mailing. See I knew with how slow sometimes the Canada Post is sending things from the south to the north…I might not get the gift before Christmas! So I posted a message about this.. and my secret Elf saw it and made sure she posted it early for me! After a few emails last Monday…(She had to reveal herself, because she was afraid my package had been attempted to delivered and didnt’ want it sent back…) I bundled up and walked down to the post office and my package was sitting there waiting for me! The sun was just setting as I walked down to the post office after lunch. WOW! what an awesome bunch of gifts…now that I’ve seen them the temptation is pretty strong…but I’m not going to give in. This is because I’m staying up in Pang for Christmas..and some family members gave me their gifts while I was in the south in November…and I want to have something to open up on Christmas morning…so waiting, I must wait…no snooping allowed! My secret Elf was so thoughtful…and did her research! One of the things I miss living in Pang is trees… and she sent a few leaves from Ireland for me! Those are so cool… thank you again for your thoughtfulness! I quickly moved my presents to my Christmas tree…where they will wait until December 25th…except the Birthday Gift and card… I’ll open that on Friday! I will have to post what is inside all of these wonderful gifts once Christmas is over. So far this exchange has been so much fun! Thanks to all Chantelle and all the team of Admins that have been running this international exchange… Merry Christmas to you! 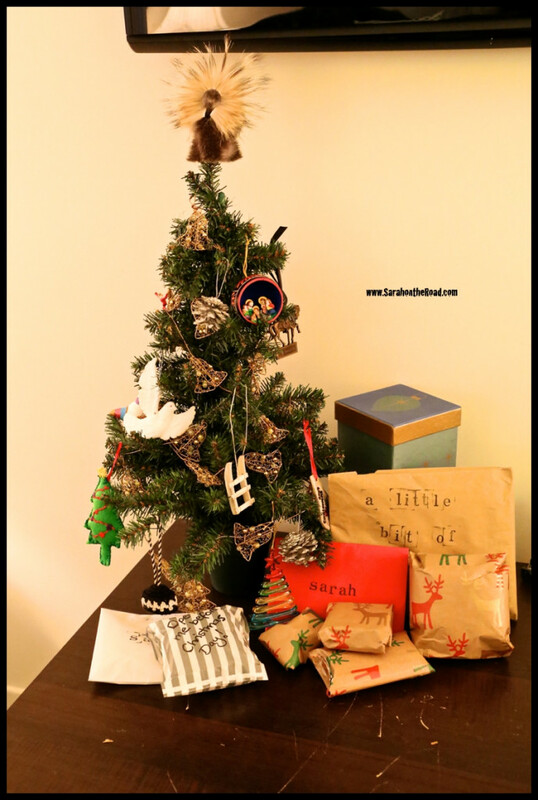 This entry was posted in Blogging Community, Christmas on December 9, 2013 by Sarah on the Road. I did a candy swap once and international postage was also high… though my Canadian partner had to pay more than I did, I think! Adding some birthday gifts and some leaves was a wonderful touch on the part of your secret Santa! Thanks Philip…it was such a GREAT idea, so glad I joined..and sending a birthday gift was completely an awesome surprise from my secret Santa! Thanks again Laura… I can’t wait to open it in a few more days! I LOVE the Birthday gift too. The leaves were such a great addition! What a wonderful idea!! 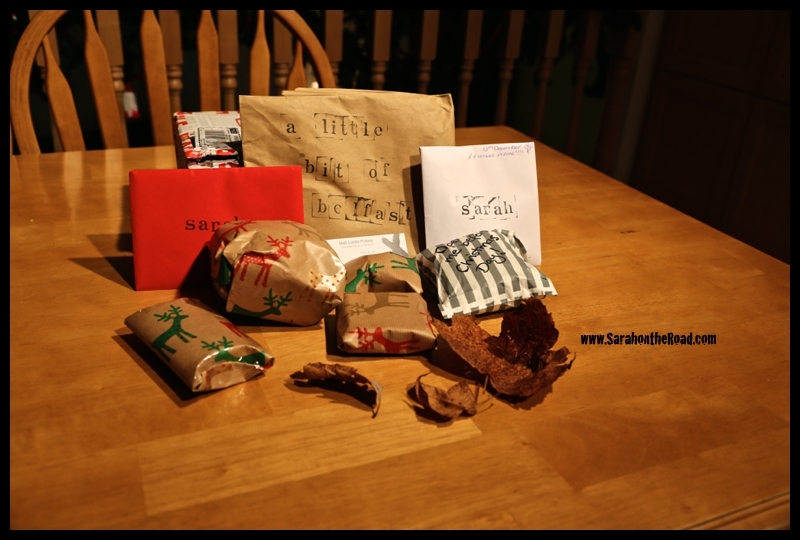 I’ve always been curious about gift exchanges like these…I will have to research one for next year! What a fantastic idea! Merry Christmas Sarah! I’ve been doing the FMS for a year and two momths. Is my first time in the gift exchange and it was awesome. My giftee refuse to know who I am, well until tomorrow’s great reveal. 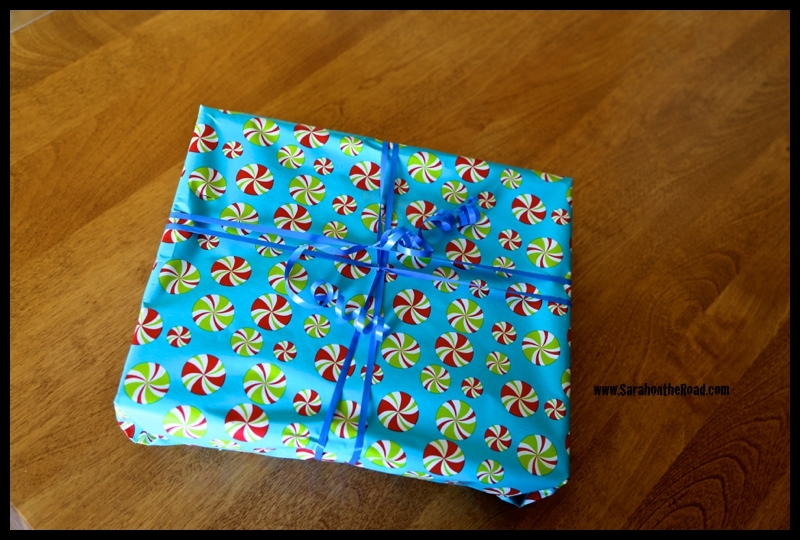 I miss the gift wrapping, due to the distance, I used the internet to buy her presents. But reading her note when she got the present was touching. I will definitely do it again.